Traditionally made with veal shanks, this twist on a Milanese classic is rich and delicious using lamb shanks instead. Serve it over Risotto Milanese, with wilted chard on the side if you like. 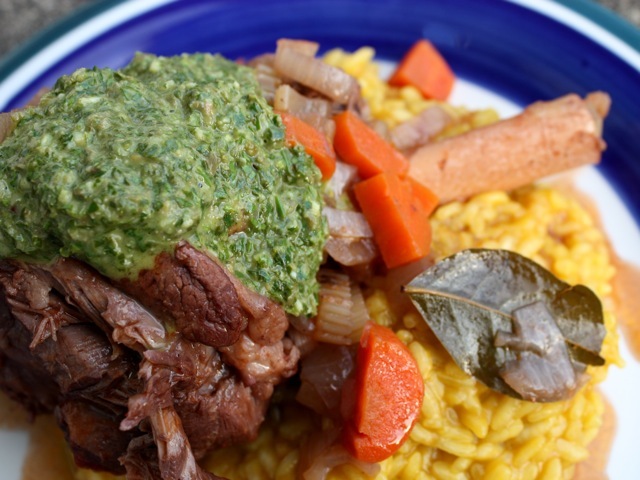 The traditional garnish for this dish is gremolata, but salsa verde also offers a nice, herby bite. Place the flour, mixed with salt and pepper to taste, on a plate. In a large Dutch oven, heat the butter and olive oil over medium heat. Dredge the lamb shanks in the seasoned flour, then brown the shanks in the Dutch oven. Add the garlic, onion, celery, and carrots to the Dutch oven and coat with the fat. Cook for a few minutes, then add the bay leaf and spices. Pour in the wine and water; the liquid should be nearly level with the tops of the shanks. Turn the heat down to low, cover the Dutch oven, and braise at a low simmer until the meat on the shanks is soft and flaking away from the bone, about 2 hours. Turn the shanks over once halfway through the braising. As the shanks are finishing cooking, add the tomato paste to thicken the sauce and give it a deeper flavor.